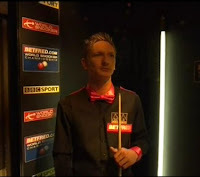 SNOOKER BAIZE BLOG: World Snooker Championship 2011 - Day 1 (Part 1) Here we go again! World Snooker Championship 2011 - Day 1 (Part 1) Here we go again! The wait is over! Here comes the start of the biggest tournament of the year, World Championship. The match between defending Champion Neil Robertson against Judd Trump starts with a scrappy opening frame, both players are quite nervous and not yet settled down! Eventually, Robertson takes the opening frame with a break of 72. The thriller keeps going on until the fourth frame. Robertson shows his breakbuilding and wins the frame with a break of 79. Trump and Robertson go to mid-interval with 2-2. In the fifth frame, it starts with a fluke red from Judd Trump. Trump goes on to make the first century in the tournament, 122. Robertson had a excellent response, a century of 127. The match comes to life after mid-interval. Both players play well and back to their forms :-) Trump once leads Robertson by 5-3 but at the last frame of the session, Robertson makes 100 to claw back. It is not too bad for the defending champion, Robertson is 4-5 down on Trump. Ali Carter practiced hard before the tournament starts and his effort was reflected on the scoreline. Carter is playing solidly with breaks 65, 66, 63 to lead Dave Harold 4-0 before the mid-interval! 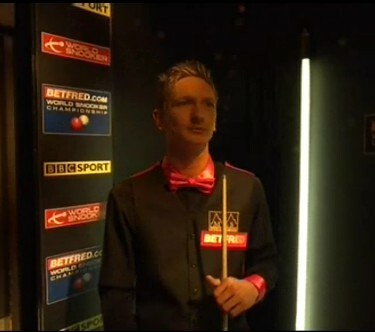 After the break, Carter extends his lead to 5-0. However, Harold finally win his first frame in the match, a century. I am afraid it will be too late. Captain needs two more frames tomorrow to get into Round 2. The Captain enjoys flying up in the sky! :-) All credits to Ali!